A new virtual continuing education initiative led by the University of Wisconsin Department of Family Medicine and Community Health (DFMCH) connects addiction-medicine experts with providers statewide to improve treatment for patients with opioid-use disorders. With support from the Wisconsin Department of Health Services (DHS), the Wisconsin Opioid Project ECHO® (Extension for Community Healthcare Outcomes) offers free, monthly videoconferences to help providers—especially those in primary care and who prescribe medication-assisted therapy—reduce the risk of opioid-related complications. Under the overall direction of the DFMCH’s Randall Brown, MD, PhD, DFASAM, each session consists of collaborative case discussions followed by a didactic presentation from a member of multidisciplinary specialist panel. 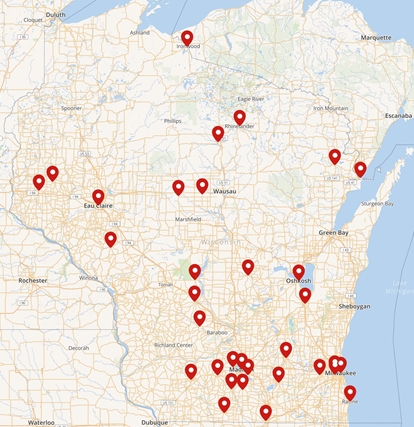 As of November 5, 2018, clinicians in 35 locations statewide have participated in Wisconsin Opioid Project ECHO® videoconferences (see map at right). The ECHO model, originally developed by the University of New Mexico Health Sciences department, decentralizes knowledge and allows experts to share their knowledge effectively at the community level. “Through these conferences, we can train providers, especially those in high need, underserved areas, on evidence-based practices for opioid treatment and recovery,” explains Dr. Brown. The Midwest has been hit particularly hard by the recent opioid crisis, having experienced sustained increases in opioid overdose mortality since 2000. According to a report from the Centers for Disease Control and Prevention, between 2016 and 2017, opioid overdoses in the Midwest increased by 70 percent, compared to a national average increase of approximately 30 percent. During the same time period, Wisconsin had a 50 percent increase in emergency department visits for opioid overdose, placing it among the top five in the nation. The Wisconsin Opioid Project ECHO® initiative complements the University of Wisconsin Addiction Consultation Hotline, also led by Dr. Brown and supported by DHS. On weekdays between 8 a.m. and 5 p.m., providers from across Wisconsin can call the hotline at (608) 263-3260 (Madison area) or (800) 472-0111 (statewide) for real-time support and expertise on how to help patients with any type of addiction issue. Wisconsin Opioid Project ECHO® sessions are held the third Friday of each month from 12:30 p.m. to 1:30 p.m. Central time. Continuing education credits are available for physicians, nurses, pharmacists and pharmacy technicians who attend the live conference session. Learn more at the Wisconsin Opioid Project ECHO® website or sign up to receive notification of future sessions.